In the last few years, the social media phenomenon has seen the remarkable increasing of social media users. Facebook and Twitter, Pinterest , and Google+ – to name a few- have linked people from all over the world, from housewives to businessmen, from politician to singers and so on. But that’s not all. Since today, a new public figure has joined the Twitter community under the account of @Pontifex: mesdames et monsieurs, le Pope is on Twitter! It’s unbelievable, I know. Actually, I’ve learned about this on Facebook just a few hours ago, when suddenly my friends were starting to share some unusual, funny Tweets addressed to His Most Reverend Excellency. Besides the classical “good” tweets indeed, I’ve found out that the Pope’s today signing up has unleashed a huge domino effect among several atheists on Twitter. @Pontifex is Benedict XVI’s generic account. So, when the Pope is dead, long live the Pope. #askaquestiontothepope @Pontifex have you sent the Mary-spacebar-Joseph sms to 48118 to find out their compatibility percentage? @Pontifex Is the ” Papa-papa-Razi” song your favourite one? @Pontifex hey, have Corithians answered after all those letters? @Pontifex was disappointed when he found out that 50 Shades of Grey has sold better than the Bible! Dear His Holiness, do you realize that @Pontifex sounds more like a condom brand? @Pontifex, since you are being so innovative, will you fill the hosts with nutella? @Pontifex, when will you publish your video-tutorial on Youtube to transform water into wine? @Pontifex, if i tweet a blasphemy, will you hashtag me with an excommunication? If i flag @Pontifex as spam to Twitter, do you think I’ll go to Hell? 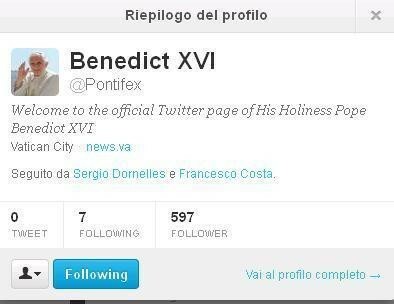 Benedict XVI has opened the @Pontifex account today, but he will remain silent until the 12th of December: Papa don’t tweet. @Pontifex, have you already started posting your pictures in the bathroom? @Pontifex, since you’re all men in there, why don’t you change ” VATICAN” to “VATICANAL“? @Pontifex will you help us entering the #hoemary tendency? The first Pope tweet will be sent on the 12.12.12, that divided by two makes 666. @Pontifex I find this totally blaspheme! Gosh, there are so many funny posts, but it’s really hard to post them all! This entry was posted in Uncategorized and tagged blaspheme, news, pope, tweets, twitter. Bookmark the permalink. ← One thing Freelancers think at least once in their life!